With the cost of a college education in the United States still on the rise, people keep seeking increasingly creative ways to help pay for tuition and other expenses. After doing some legwork, we compiled a list of 10 college scholarships that may have passed under your radar, which your child may be eligible for but may not have considered. This organization supports the livestock industry and farming with a variety of educational and charitable contributions. Their scholarships seek to reward eligible Texas students who are involved in related activities. Amount: More than 10 scholarships, ranging from $4,000 to $18,000. Eligibility: Scholarships for 4-H, Art, HLSR exhibitors and others are available to graduating high school seniors who are Texas residents, U.S. citizens, attend an eligible school, have completed the Free Application for Federal Student Aid (FAFSA), and will be registering at an accredited, not-for-profit university in the State of Texas. In promoting automatic fire sprinkler systems, this organization provides education and consultation to open-shop, fire-sprinkler contractors. With this scholarship, students can learn about the safety of automatic sprinklers and earn money for college. Amount: 10 scholarships worth $2,000 each and five scholarships worth $1,000 each. Eligibility: High school students who are citizens or legal residents of the U.S. can participate in the High School Senior Scholarship Contest or the Second Chance Scholarship Contest. This open-book, online test promotes awareness about automatic fire sprinkler systems. Students read an educational brochure and answer questions that help support the facts in the brochure. For college students aspiring to work in the grocery industry, this could be a great fit. Amount: 10 scholarships, up to $8,000. Eligibility: The association seeks to promote high-quality students who aspire to work in the grocery industry, with a special focus on students interested in independent retail and wholesale sectors. The scholarships are available to college juniors and seniors as well as graduate students working toward degrees in business, food management or related fields of study. 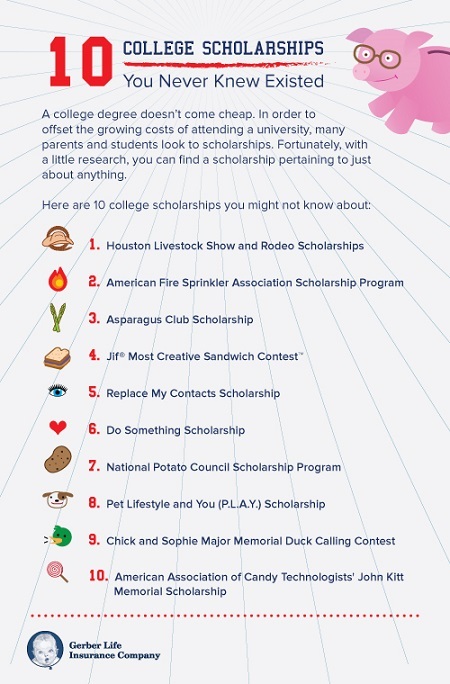 Earning money for college may have never been as tasty as this scholarship opportunity. Amount: $25,000 Grand-prize Scholarship and Runner-up Scholarships of $2,500. Eligibility: To enter, parents or legal guardians must complete the entry form, including their child’s original sandwich recipe using an eligible Jif® product, an original name for the sandwich, and a photo of the completed sandwich, according to the directions listed on the entry form. “Seeing is believing” is one way to describe this scholarship. Eligibility: This online survey and essay contest (the public votes on the finalists) about contact lenses and eye glasses is open to high school seniors in the U.S. and to full-time college undergraduates in the U.S. in their freshman, sophomore and junior years. High school and college students who have an activist spirit may want to check out the scholarships available through DoSomething.org. Eligibility: The organization’s scholarship opportunities involve participation in social-involvement campaigns that seek to improve communities and the world through charity and by inspiring change. If you’re trying to cure potato plant ailments or grow a better spud, for example, the NPC may be able to help fund your studies. Eligibility: High-performing graduate students whose research can benefit the potato industry are eligible. Are you an animal-loving high school junior or senior who’s also a good writer? If so, perhaps you’ll find this scholarship opportunity warm and fuzzy. Eligibility: High school juniors and seniors can apply for this scholarship by composing essays about their animal activism and volunteer efforts. P.L.A.Y. staff selects the winning essay based on the captivating nature of the story and the demonstration of high-quality writing skills. If it looks like a duck, quacks like a duck, and you know how to call it – and live near Stuttgart, Arkansas – then try calling upon this monetary possibility for college seniors. Amount: Four scholarships from $500 to $2,000. Eligibility: This contest celebrates the legacy of Stuttgart’s champion duck callers and duck-calls maker, Chick and Sophie Major. High school seniors near Stuttgart, Arkansas who know their way around a duck call can participate in a live competition to win one of four prizes. Eligibility: College students who are majoring in a food science, chemical science, biological science, or related area, and have ambitions of joining the confectionary industry, can apply for the AACT’s John Kitt Memorial Scholarship.